It's a pretty clever move. Too bad we had to force it. But rather than address the bill as expected, Jeff attacks the Neocatechumenal Way and exposes what we have known all along, that Kiko and Filoni have been pulling all the strings. However, at the same time, Jeff wants us to believe that Hon is doing all he can to bring unity to this diocese. Hon spent his first 3 months here carrying out - or trying to carry out - Filoni's agenda. It's only after we backed him into a corner that now he's saying "look, I'm on you side." And second, Hon, thanks to Jeff, just split this diocese over the weekend more than Apuron ever did. What a shame that we have to shame our clerics into telling the truth. Keep the pressure on. Who know's what else they may finally tell the truth about! And besides. It was Hon's signature at the bottom of that KEEP OUT note at RMS! So David trying to push his weight around and yet every mass he's presided over, he'd ask for money to support the RMS. What a stab in the back that the laity has to make arrangements in order to see the RMS institution for half baked neo priest. They are just hiding so much in there. It's not a clever move on Fr. Jeff's part because he has just exposed himself to getting fired or removed by telling the truth on what happened. This is a move to salvage his integrity. Unfortunately, he fell for the argument that it's better to save assets than to make our Church holy again. Too bad for him. And so? Filloni is who or what to our archdiocese? Man, all these power plays are making me dizzy. Hard to keep track of who's beholden to who, who's kissing whose a$$, and who trumps who. Maybe we should call their bluff, go down there en masse and bang on the gates. Can't you just see it? The cops dragging all those "little ole ladies", former altar servers, Tan Maria/Tun Jose, the techas and their grandchildren away because a NEO cardinal from far, far away said we couldn't visit our own seminary. Dalai esta este na babarias! NO MORE LIMOSNA! DEFROCK APURON! SIGN THE BILL, GOV! Tim. I am not buying Fr.Jeff's emotional address. If not for the world attention on this case Jeff would have continued supporting the evil malicious vicious reckless Apuron. The Bill needs to be made law because the Archdiocese of Agana is morally bankrupt. By what authority do you interfere with Catholics on Guam? Filoni, nicknamed "the red Pope", is the head of the congregation supervising all missions. I'd rather ask him: "why were you so scared by a small group of lay people? ... what could they find in the RMS premises? or... who?" the more filoni asserts control, the weaker the vatican's long-held position seems to become, that it's immune from liability in local diocesan messes. which way is it, rome--hands off or hands on? should we try to invite you to court and depose you as well, dear cardinal? Jeff you have really been used as a pawn. A part of me feels bad for you. But at the same time this past 72 hours you have divided the church more than Apuron did in thirty years. Jeff you know the sexual sins of Apuron. You know how we all suffered because of him. Days of defending him are over. We must pass this bill into law so that never again will an anthony apuron rule this church. We know his evil we know the damaged he caused. Please support the passing of this bill to law. Forgive my ignorance, but what official role does Cardinal Filoni have with respect to the RMS? In other words, is the Cardinal weighing in because of his role in the Congregation for the Evangelization of Peoples, or because he is a senior Kiko-enabler? I am a neighbor of Cardinal "Finocchio" (in italian "finocchio" means gay), living only ten miles from Rome. 1.If the "Redemptoris Mater" Semnary belongs, as it should be, by Diocesan law to the Diocese of Agana, Cardinal "Filou" (in frenche "filou" means gangster, disonest) has no right to interfere. 2. If the R.M. Seminary was stolen from the Diocese by Apuron, Gennarini and his team, and in truth it was stolen from the Agana Diocese, Cardinal Filou has either no right to interfere, but only Kiko Arguello, Pope Francis or the public authorities of Guam. I thought that each Bishop is solely responsible to oversee the jurisdiction that he is given to shepherd. What business does Filoni Balony have to interfere with the matters of the church in Guam? Technical note. WHILE Filoni is the head of the Congregation for the Evangelization of people, he is over stepping his authority in the matter of the Seminary. 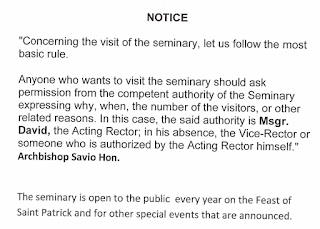 The competent authority being the Congregation for Clergy since the Motu Proprio of Benedict XVI of 2012. This is a clear case of interference from Filoni into a domain that is not his. This, of course will help us on the long run. Thanks to David the inept canon lawyer and newly minted Rector of RMS. We always should appreciate a useful idiot. or . . . David could be lying. Wouldn't be a far fetched notion. filoni's congregation is in charge of missions and oversees the ncw. i believe that includes clergy formation, as long as it's for the missions (making it at least a shared responsibility with the congregation for clergy). so if this is the case, then yes, he is the competent authority over rms. 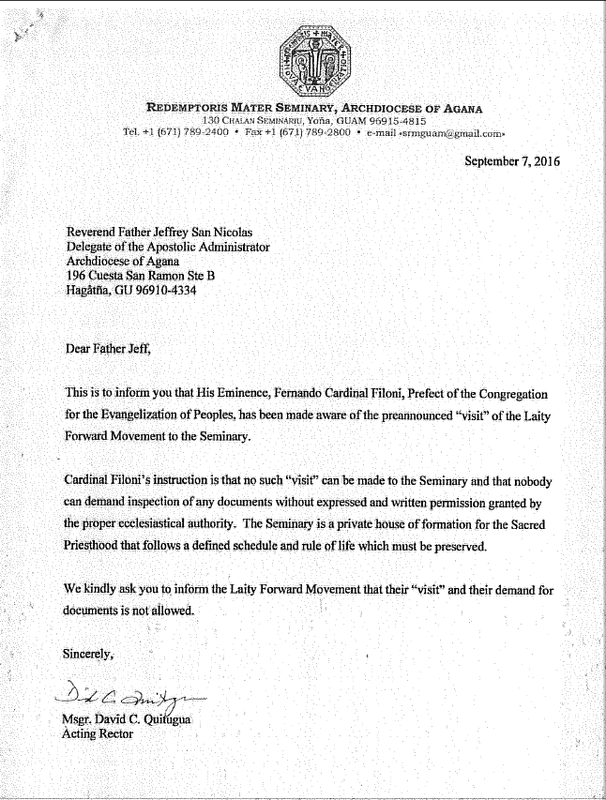 but that same line of reasoning would also admit that rms doesn't belong to the archdiocese of agaña. so which way is it, feloni? The Motu Proprio is extremely clear as to whom befalls the responsibility of seminaries. All seminaries including but not limited to those involved with congregations of religious life. Benedict did cut through the chase on this issue and that of the continued education of priests and deacons. Believe me this great ammo for our cause. Filoni might be devious and powerful, but. He stepped on a lot of feet on his way up. Italians don't forget easily. Ooh, Cardinal Felonious is gonna be pissed! Fr. Jeff, nice speech but for me to overcome my skepticism, I'd like to see you at the next protest rally in front of the Cathedral. Bring Hon along! Once before, I asked Mr. Filoni to tear down this wall. Now, it seems the holy man is on his way to getting something torn of him. Look it as your sacrifice Eminence. The people of Guam need to take control of their own Church. It is now under serious threat of NCW takeover. You should all read the findings of the RMS. Take a good look at the expenses. Interesting to see how the Archdiocese bails them out. If it weren't for additional $$$$ they would be running in the negative margin. NO MORE DONATIONS HERE! If you have the time to read 141 pages then do so. Very interesting reading. Why are you begging the NCW to have mercy on us? Who the hell is the NCW, Are they now law and order in Guam? I say again, defrock Quitugua, Cristobal and the entire lot of NCW from Guam, only then will we have the freedom to start healing and rebuilding our Church. Good insight 8.48pm. Who the hell are the NCW they have no authority over Guam. in this era of anti-bullying, this scene of david c and the ncw and fr jeff begging for mercy look like a common bullying scenario. Regardless of what was said today about unity within the church, the neocats are still refusing to cooperate and want their dear Tony to remain at the helm of the church. Actually Filoni was completely within his authority. 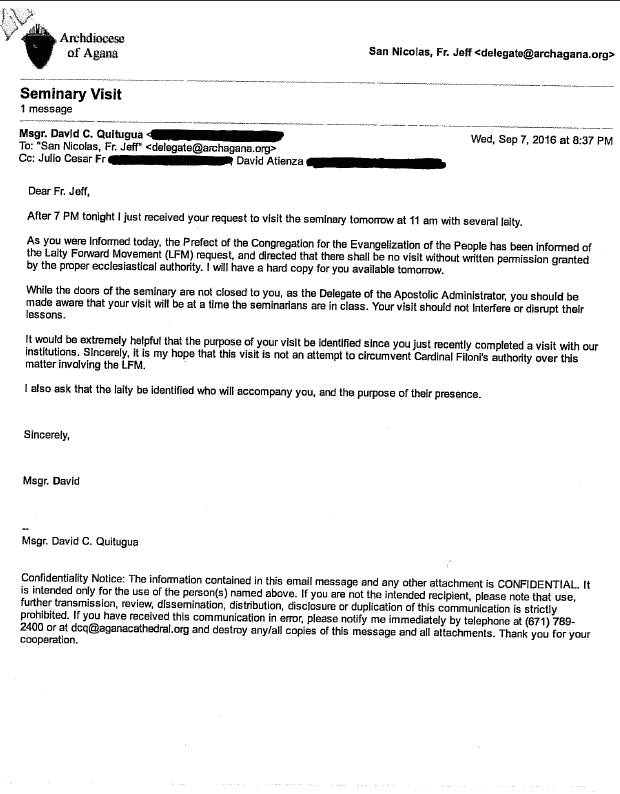 And the letter proves EVERYTHING I've been saying about RMS NOT being a "seminary for Guam." I'll explain soon. So the Rector calls his daddy and says "dad the bad people are coming to visit and I'm scared!" So daddy says don't worry son I will take care of the bad people. Except daddy don't live here which makes his son a fatherless child! David Quitugua, Shame on you for all of your efforts to prop up Apuron and the NCW. IT WAS THE WRONG WAY! While Fr. Jeff took a stand against the NEO, he also called for everyone to forgive and move forward! NOT POSSIBLE Fr. JEFF. 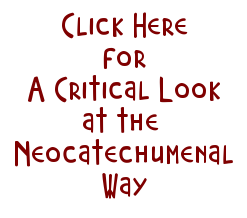 The NEO are disobedient to the Pope, the Magisterium and 2000 years of Tradition. 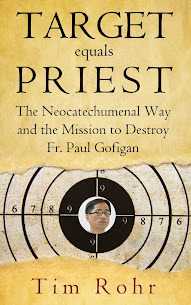 That makes the NCW HERECTICS and wolves posing as priest until they get their WAY and eliminate the priesthood! WAKE UP AND SMELL THE ROSES FR. Jeff. The NCW want to change the Church, the "missionary" work is a sham. Come to Guam, we'll need you for testimony when the lawsuits are being heard. Cardinal Felonius Monk. I wonder if he likes jazz? The FLM visit to the RMS was cancelled because “Cardinal Filoni’s instructions is that no such “visit” can be made to the Seminary … without … permission granted by the proper ECCLESIASTICAL authority.” Fr. David-the-Lurch cites ecclesiastical authority reason. When the RMS was deeded to the NCW in 2011, it “… was not done in a usual way by an internal ECCLESIASTICAL agreement …” yet the NCW considered the ownership transfer process as legitimate. Another example of the NCW conveniently using something if its suits their purpose, then disavowing the same thing if it doesn’t suit their purpose.